The GameHippo.com was a website that provided thousands of free PC games for download, it was quite popular in the early to mid-2000s and many of the games featured in the Free Games A to Z list were first found there. It appears to have been sold in 2007, and unfortunately, the new owner or owners did not maintain the site, and it was eventually taken offline. This is only speculation and the below timeline gives a brief look at an outsiders view of the history of the site. Despite the demise of www.gamehippo.com and the www.thegamehippo.com there are still plenty of sites where you can get your free PC game fix. A number of sites can be found on our list of Free PC Game Websites. 10/24/2009: GameHippo is back! Well, at least a revival site that looks spot on like the original. The new site can be found at www.thegamehippo.com and it features new freeware game reviews and download links. Welcome back! www.gamehipporedux.com is still out there but it has not been updated in months and the forum is pretty much dead. 8/21/2009: GameHippoRedux.com appears to have stalled. There is a forum for those interested in trying to get the site moving but at this point, there doesn't appear to be much in the way of new additions or development to the site. 11/1/2008: GameHippo.com is going through a rebirth of sorts. The new site will be called www.GameHippoRedux.com. You can check out their fan forum for the latest updates on the project. 9/1/2008: GameHippo.com appears to be officially gone for now. The latest link has been down for a month. There is a fan forum that is still going and working on bringing us a new GameHippo, I will update this page if there's any change in status. 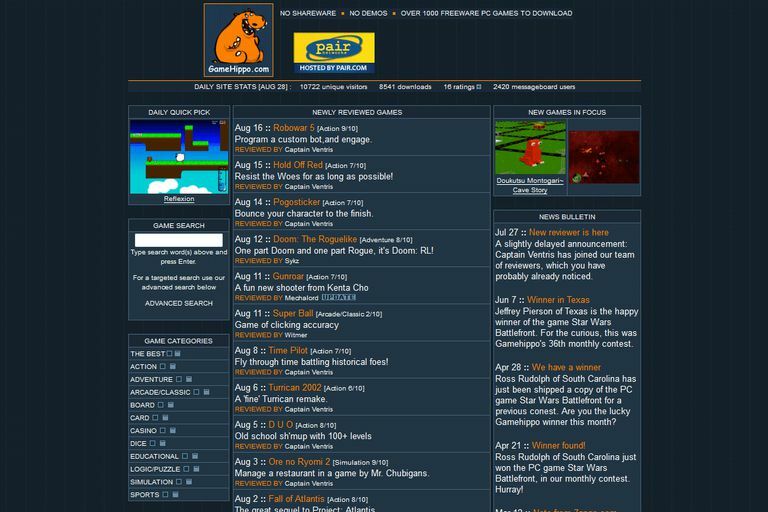 7/20/2008: Looks like GameHippo.com is back online...not sure if it will be under a new domain name or how long this will be up but here it is. 7/14/2008: Unfortunately www.gamehippo.com is no longer online. To date, no reasons have been given for the demise of one of the great collections/listings of independent and freeware games. Check back from time to time for any updates. TheGameHippo.com has just been launched but looks very promising, however, due to the issue surrounding the original GameHippo site and it's last owner there are only 100 or so games up on the site. With that said the premise behind the site remains the same all freeware, all the time. They do not mix freeware, shareware, and demos which can always make it harder to find the truly free games. All games listed on Game Hippo have been installed, played and reviewed by the GameHippo Staff. On top of free game reviews, each listing contains basic information that tells you whether the game is single player, multiplayer, contains adware, child-safe and more. Searching GameHippo is a breeze with a standard title search and an advanced search on top of browsing games by category/genre. The response time of searching on GameHippo is also very good, with fast response time and no annoying pop-ups or advertisements. Downloading a game listed on TheGameHippo has been made much easier. The download links are no longer hidden at the bottom of the review in an indistinguishable text. Now each game page features an orange download button front and center, directly under the game title. Remember the High Definition D-VHS Format?